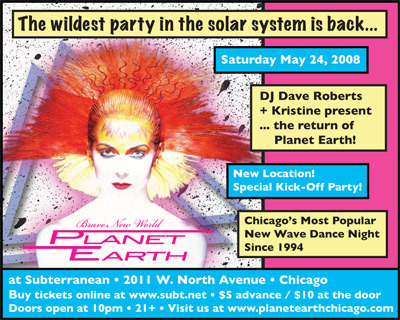 Some of you know that over the last eight years I’ve been heavily involved in both online and print promotions for Planet Earth Chicago, our city’s best, most popular, and longest-running New Wave dance club night. The story of how I got involved with Planet Earth is mentioned toward the end of this interview, and a fictionalized version of Planet Earth is one of the main settings for my short story “Love The Shirt,” which was published in the Summer 2004 issue of Blithe House Quarterly. Earlier this year Planet Earth moved on from the little nightclub in Lincoln Park where it had been since relocating from Club 950 eight years ago, and is now starting the next chapter in its history with a special “Brave New World” kick-off party at a brand new location: Subterranean in Wicker Park. In addition to the usual music and glamour, Dave & Kristine are promising alien dancers, roaming paparazzi, and other surprises â€” and the fine folks from Laurie’s Planet of Sound will be hawking tons of New Wave 45’s, records, CDs, t-shirts, buttons, and other goodies. So, if you like dancing to New Wave and punky music from the late 70s and early 80s, come join me and my fellow Earthlings next Saturday night. In addition to this old New Waver, I have it on fairly good authority that you’ll spot at least a couple of my colleagues from The Neo-Futurists, The Partly Dave Show, and even a Schadenfreudian in the crowd. Oh, and a word of advice: There will be a line out the door for this thing, so if you’re coming, you should snap up an advance ticket ASAP, so you can breeze past the line like the rock star you are.